The most widely consumed stimulant in the world is coffee. 2.5 billion cups are brewed each day. "Good to the last drop," except that sometimes it's not. If you leave the pot on the burner too long, the coffee becomes bitter and acidic and an oil appears on the surface. Single cup coffee makers alleviate this problem. Ground coffee becomes coffee grounds by pouring very hot water over it. Basically, a highly prized commodity becomes garbage almost instantly. 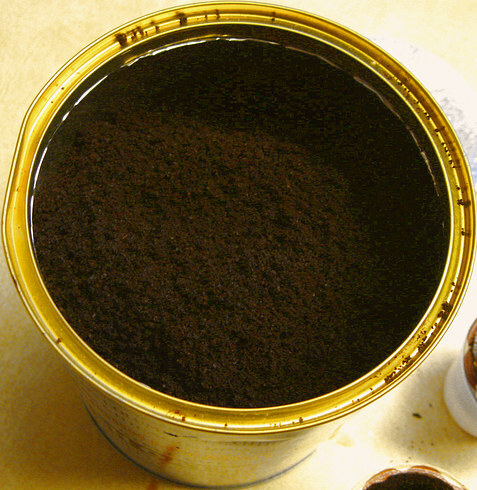 The used coffee grounds resemble "ground" as in dirt, and we're told to put them in our compost bins. The roasted coffee bean is very hard and remains so after it is ground up and used to brew coffee. 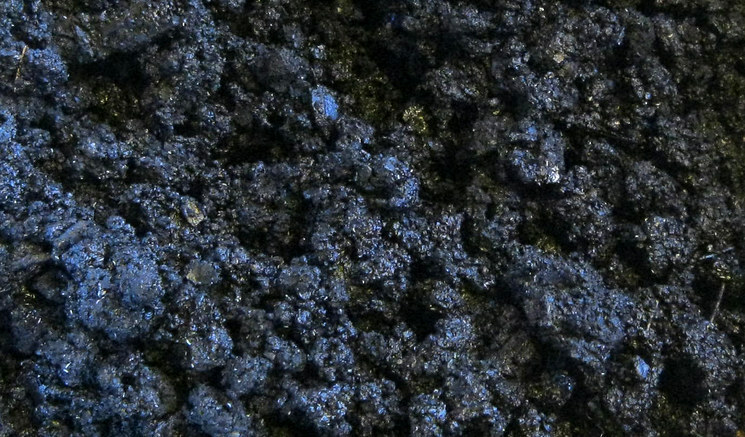 Wouldn't adding coffee grounds to your compost bin be like adding oily, acidic gravel? 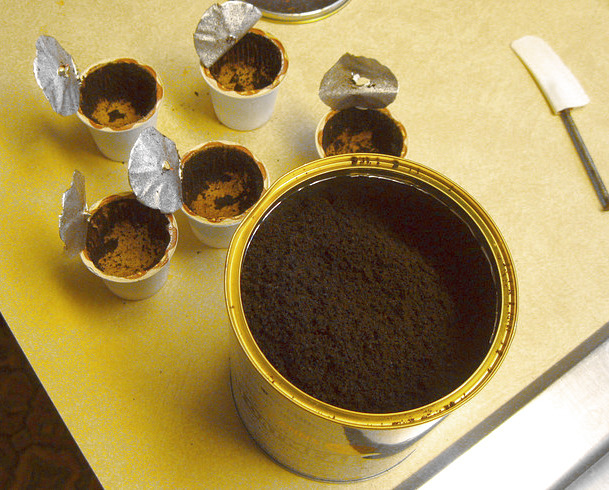 Do coffee grounds need composting at all? 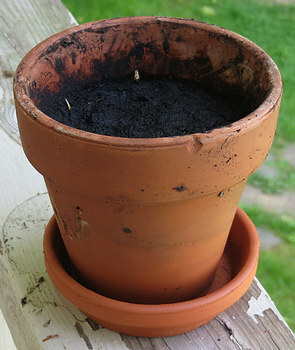 Let's try to grow a plant in fresh coffee grounds. On the left is a begonia. In the center are some cuttings from the begonia, and on the right, one of the cuttings has been planted in recently used coffee grounds. 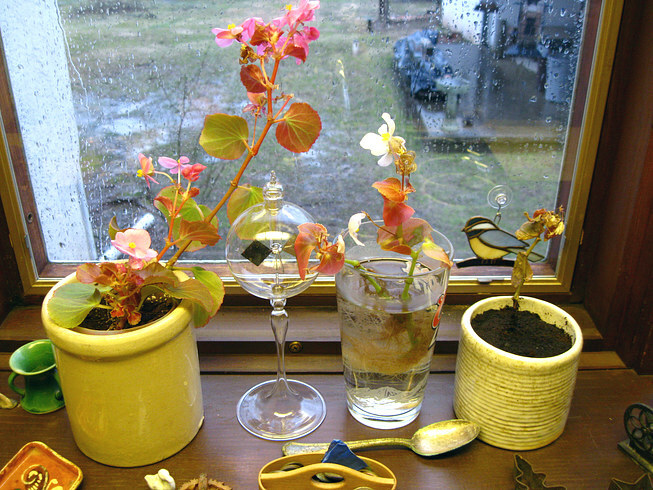 Since all the plants are the same plant, we have a perfect control for observing the growth of the begonia on the right. By the way, it's March 23, 2014. 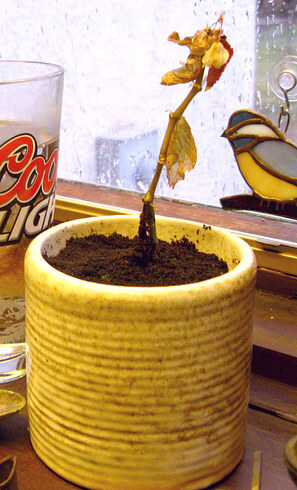 In a matter of days the begonia in the coffee grounds has died. Mold started growing in it after a week. 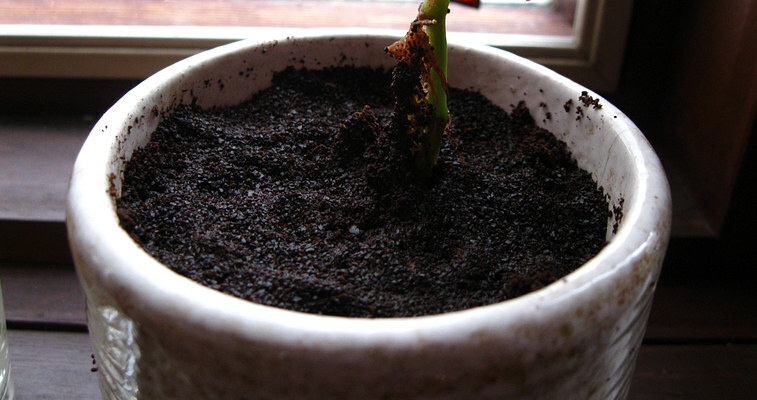 Ok, so you can't grow a plant in coffee grounds, but can you compost them? 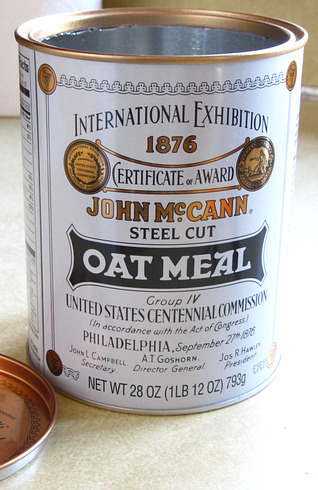 I filled an empty oatmeal can with coffee grounds and put it outside on the porch. For 8 months. Once a week I stirred the grounds. I didn't see anything happening and I figured the pH of the coffee was killing off any bacteria that might be trying to compost the beans. I obtained some real compost from my neighbor and mixed it in, but I think the bacteria in the compost died, too. 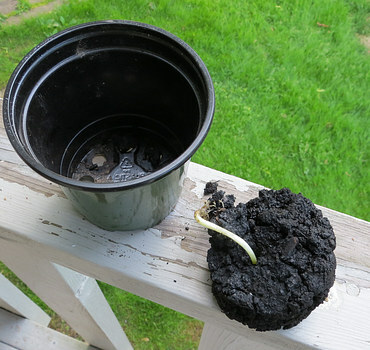 One day I found it while I was cleaning up and on April 11, 2015, the "Great Coffee Grounds Experiment" continued. 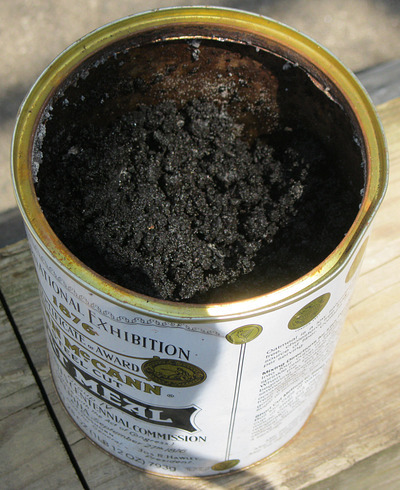 I opened the can and looked inside. It still smelled faintly like coffee, but it didn't look like coffee. This is how the grounds looked after being in the can for a year. 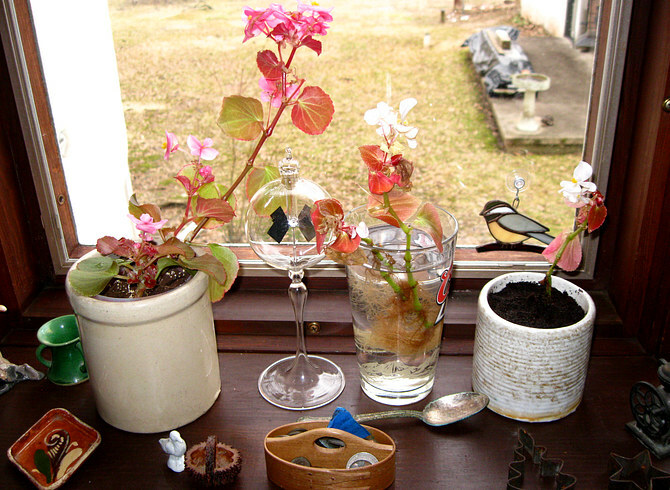 A cutting from the same begonia plant was put into the same pot and placed on the same windowsill at about the same time of year. The coffee grounds reminded me of chocolate brownies, except they were black. 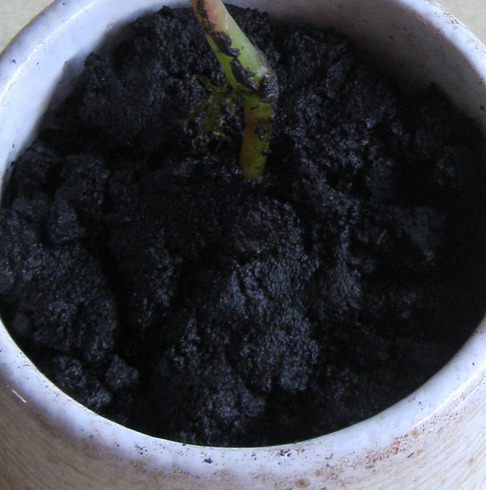 The begonia after one day. April 12, 2015. No noticeable change. 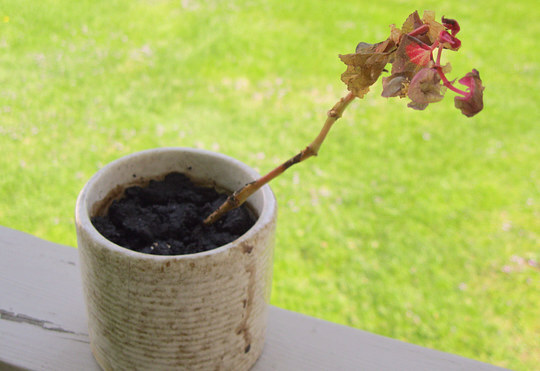 Will the begonia live or die? I think it might live, but only time will tell. 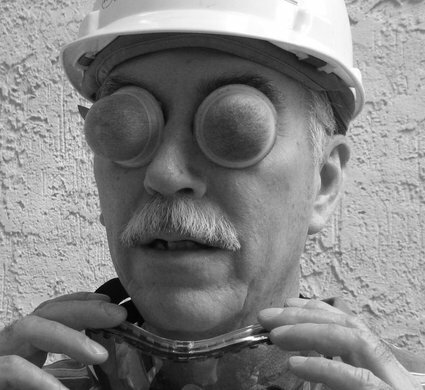 By the way, the inventor of the K-Cup, John Sylvan, regrets that he ever invented them because they are not recyclable. They are made of #7 composite plastic, which is nonrecyclable in most places. 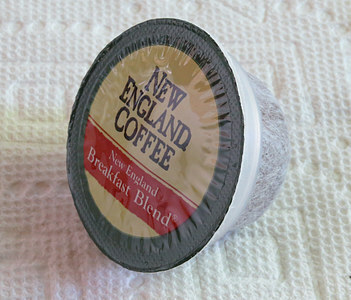 Keurig says they will have a recyclable K-Cup by 2020. FIVE years from now? 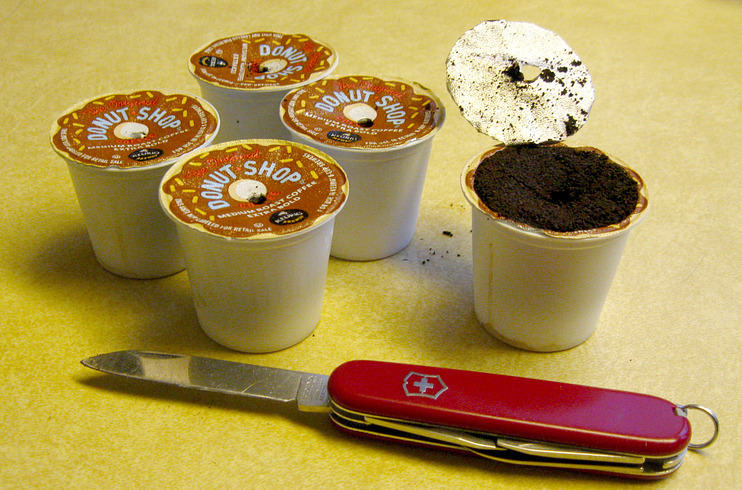 How hard would it be to make a cardboard and paper K-Cup? April 13, 2015: The begonia still looks the same. 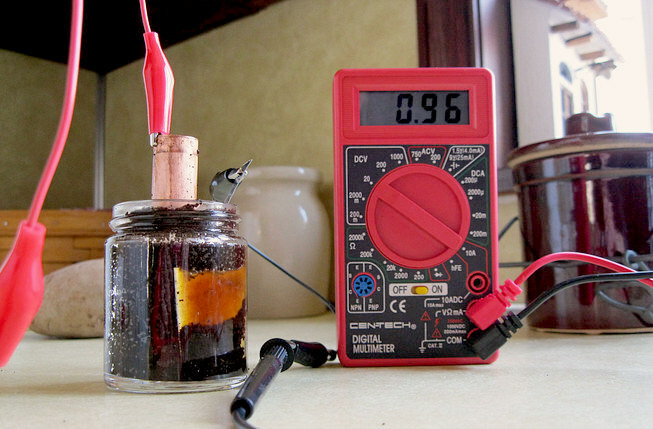 Greg from CA wrote and asked about using coffee grounds as the electrolyte in a copper-zinc battery. It produced .96 volts, slightly less than using a few drops of vinegar (1 volt) but more than using a potato (.92 volts). April 14, 2015: The begonia still looks the same. A good sign. By this time last year it was dying. Keurig announced yesterday they made 4.7 billion dollars in revenue in 2014; 3.1 billion dollars of that was from the sale of K-Cups. Not surprising, the construction of our coffee maker was outsourced to Simatelex, whose factories are in Shenzhen, China. April 15, 2015: No change in the begonia. 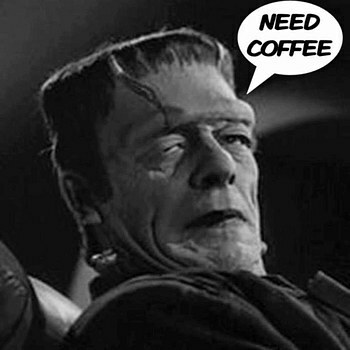 Austin H. from Australia wrote and said to name the coffee battery the "Simpson Cell." 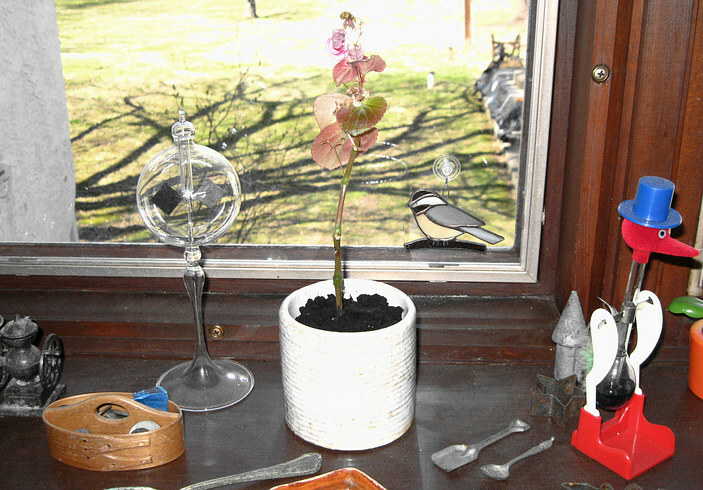 April 16, 2015: The begonia doesn't seem to be dying, but it doesn't seem to be growing, either. I gave it a bit of "Miracle Grow." 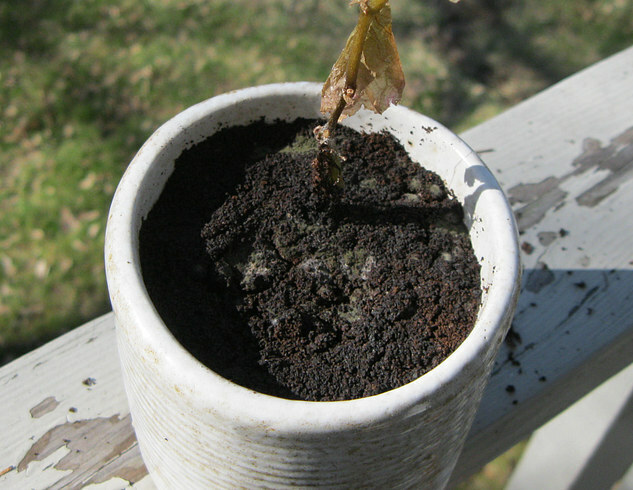 April 20, 2015: The begonia is growing a new leaf! April 25, 2015: I almost drowned the begonia. I watered it and wondered why the water wasn't going down. Then I realized the pot was full of water. I am caring for it to death. I found out coffee beans aren't beans, they're seeds. 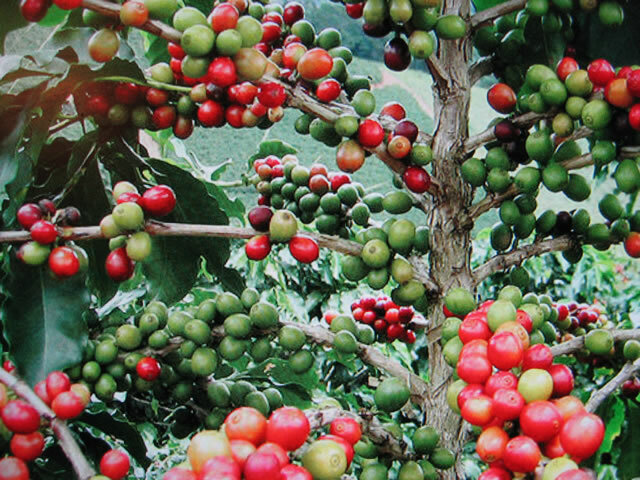 They are the pit of a "cherry" that grows on a coffee plant. Later, while listening to "You Bet Your Garden" on WHYY, Mike McGrath recommended spreading coffee grounds around Azaleas and Rhododendrons after they flower to make the soil acidic. 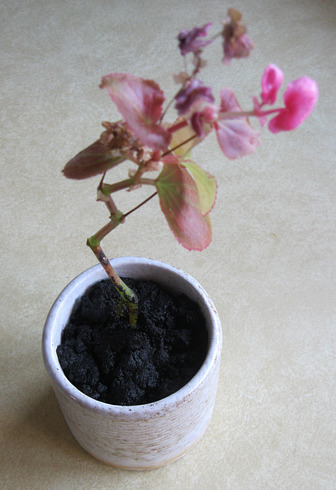 May 2, 2015: The begonia is in pretty bad shape. Question: Why is it... that you can grow a begonia in a glass of water, but once you put it in a pot with dirt, you can drown it? Man, Funk Dat! May 4, 2015: I killed it. The stem is rotting from too much water. May 5, 2015: So what have we learned? We need a pot that drains. 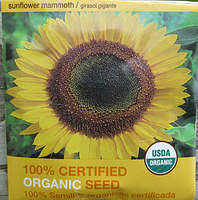 Let's start over, but with a sunflower seed. It grows a lot faster than a stupid begonia. 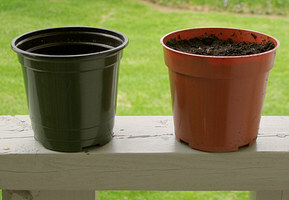 Here we have a pot with the coffee grounds from the begonia experiment, and a "control" pot with potting soil. May 14, 2015: Humpf!! Well.... maybe the seed was bad. We'll try again. grounds. The two on the right are used. They swell up but are dry to the touch. 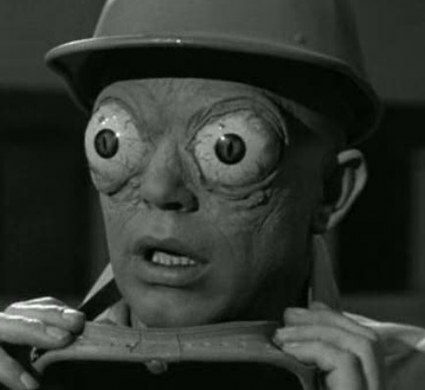 While we're waiting to see if we can get a sunflower out of the coffee grounds, we can pretend we're "The Mutant"
from The Outer Limits. 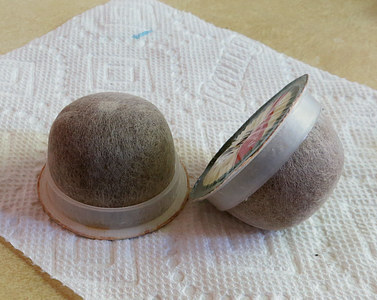 Carry two coffee pods in your pocket to break the ice at parties. 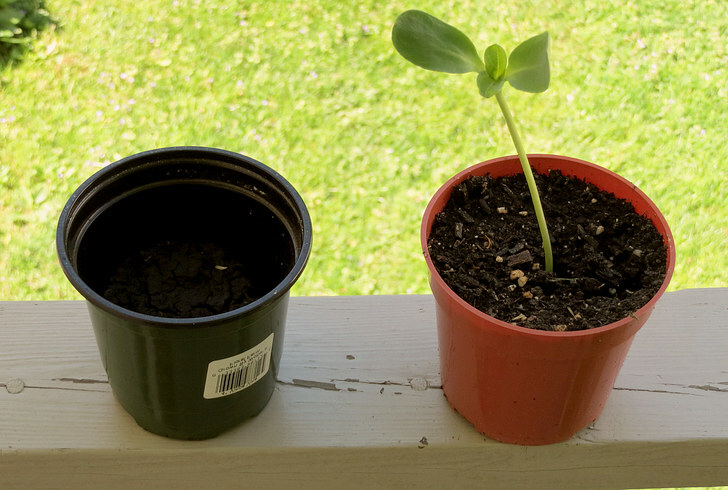 May 16, 2015: Well it seems a sunflower did sprout, but when the coffee grounds dry out they are as hard as a rock. The poor guy couldn't couldn't grow up, so it grew down. 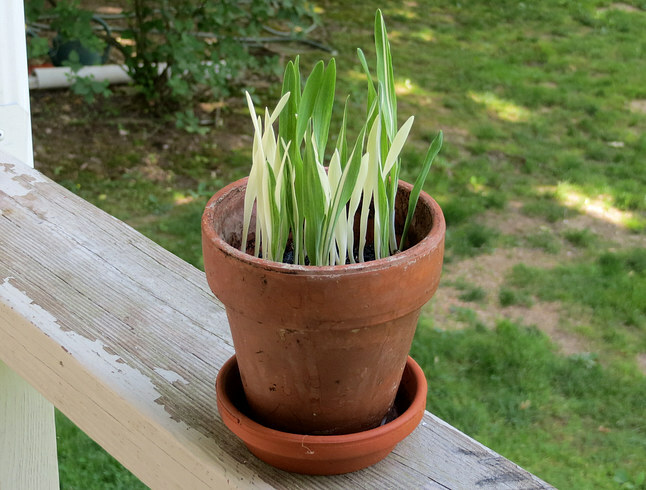 Also, whenever the grounds are watered some of them seep through the holes in the pot, so there is less and less material. 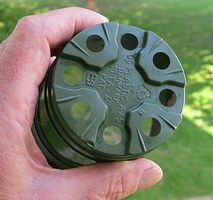 The solution - a smaller pot with ONE hole in the bottom. 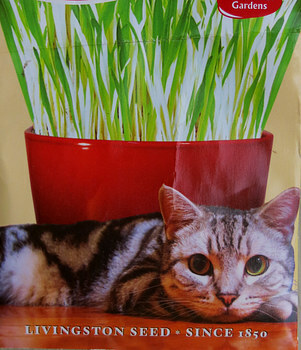 I couldn't find any more sunflower seeds, so I planted CAT GRASS. May 27, 2015: Alive, it's alive! It's ALIVE!! Click on the picture! Hahahahaha!!!! Well, there you have it. 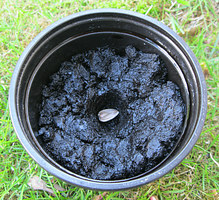 It IS possible to compost coffee grounds! How long did it take you to read this? You'll never get that time back. We now return you to your regularly scheduled program, which is already in progress.